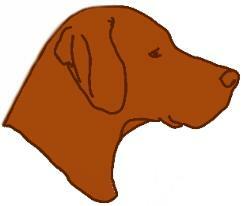 Vizsla Stud Dog Registry @ JCW (USA & Int'l). Vizslas, Vizsla Stud Dogs! Passing Hip Score Required! Vizsla Registry @ Jayney's Creative Works (JCW). Welcome to the Vizsla Stud Dog Registry @ JCW. JCW website is meant to be a tool for the Vizsla Breeder(s), as well as the Stud Dog Owner(s). better serve the Breeder(s) in their research. you have agreed to make your information and picture(s) public domain. A simple short cut would be to copy and paste the below information into your email to me. Let me know if you need assistance. Vizsla Stud Dog Registry @ JCW, unless you post 1 unaltered. Professional Stud Dog Ads welcomed. 5 picture maximum. (Excellent, Good or Fair). The below information must be completed unless noted optional. I recommend CHIC Health Testing. KENNEL NAME: Optional *You can also include social network links for your kennel! Facebook, Twitter, Instagram, Pinterest, etc. OFA# (or Int) Hip Score: https://www.ofa.org/ Passing hip score required. OFA: Optional, all other health certifications will be summarized here when I verify your OFA Hip Score (i.e. : Elbows, Thyroid, Cardiac and Eyes: Normal). Penn Hip: (LH/RH) Optional... Effective 10/12/17: To add PennHip click here and follow the directions. After the PennHip has been added to OFA, please send to vizslaregistry@aol.com. Copyright 2006-2019, Vizsla Registry, Jayney's Creative Works, All rights reserved. Please submit your pictures (maximum 5) for the registry when you send in your information required. Professional Stud Dog Ads welcomed. Training a puppy is like raising a child. Every single interaction is a training opportunity.